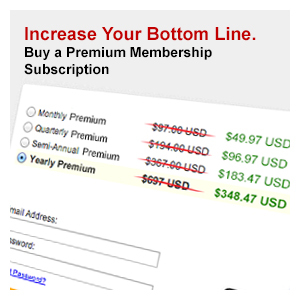 Start the year off right by getting more for less with your EzineArticles Premium Membership benefits package! For the serious and successful Expert Author who wants even more highly-qualified traffic back to their website or blog, EzineArticles’ Premium Membership package gives you significantly higher speed, confidence, control, convenience, freedom, and intelligence than you’ve already come to expect from our free membership, thereby increasing your overall article marketing success … and your bottom line. Monthly Premium Was $97.00 Now $49.97! Quarterly Premium Was $194.00 Now $96.97! Semi-Annual Premium Was $367.00 Now $183.47! Annual Premium Was $697.00 Now $348.47! Article Templates Was $47.00 Now $19.97! Get Expedited Article Review for Faster Publication: Your articles go to the front of our editorial queues to be reviewed before all non-Premium members (that’s before all Basic, Basic Plus, Platinum, AND Diamond members). Receive Priority Member Support for Real-Time Response: When you have a question, concern, or would just like to run something by our Support team, the priority member support Premium benefit gives faster response turn around than non-Premium members (even faster than our elite Diamond level members). Snap Up Call-to-Action Power with 12 Resource Boxes: Gain greater control to target your audience with a call-to-action that’s ideally suited to the content of each article. Adding an additional 9 Resource Boxes for a total of 12 Resource Boxes per profile will effectively increase your click rate, transparency with your readers, and branding power. Reel in 30 Reader-Targeted Keywords to Amplify Searchability: Obtain access to an additional 25 keywords for a total of 30 keywords used to find your articles! This data-driven intelligence allows you to simply integrate rich keywords into your article titles and Resource Boxes to increase your search power and traffic. Lineup Scheduled Article Release for Enhanced Exposure: Scheduling your articles means you don’t “dump” them on your most loyal readers, which could potentially reduce the traffic you receive. Publish your articles when you know they’ll be most effective by targeting your article release for the best time for your niche with this great benefit. Attain Success-Driven Article Performance Reports: Get access to the metrics that help you strengthen your efforts and grow. Including comparative data from views to click rates to EzinePublishers and more, this monthly data helps you determine which article topics bring you the highest level of success in order to write more success-driven articles. What are you waiting for? Give your article writing and marketing a huge boost by taking advantage of a Premium Membership today. Whether you’re a brick and mortar or an online entrepreneur, a professional writer, or simply working to enhance your personal brand, you’ll find Premium to be your ticket to success. P.S. We’ve also slashed prices on our Article Templates package of 52 article templates – now only $19.97. Increase your exposure fast by building a huge article library quickly and easily. Visit http://shop.ezinearticles.com/ArticleTemplates/ for more details. Thanks tons! I just snapped up the 52 article templates as fast as I found them. I have been wanting them passionately for ages, but could not meet, for me, the steep price. Finally I have them and I am so happy. What a perfect way to start the new year! I sure will consider the premium membership offer if you keep it up for awhile. Thanks again and Happy New Year! That’s a nice deal on the article templates. I might have to scoop that up before it’s too late. As a new article writer it is many times difficult to get writing ideas for my specific information niche. As soon as I purchased and downloaded the article templates I got an almost immediate flood of new ideas, well worth the purchase price all by itself! Fantastic buy! Glad to hear they worked out so well for you. We’re in agreement – they are a GREAT value. For a start, I wish to say:HAPPY NEW YEAR TO ALL, with EzineArticles. May the Good Lord spare our lives,and provide us with the good things life deserves to propel us through happily and peacefully. The BIG NEWS: Premium membership slashed prices, are in fact, not only big news, but great news, that will for sure lead who ever happen to register a huge success. The current prices, put smiles on the faces of some of us that find the old rates too high to temper with. Now, almost all, including me, are nursing the ambition of becoming a permanent member. However, it is my sincere hope to by the mid 2013, to be tagged a premium member, to derive home all these out lined benefits, and with this, I say thank you all. Sounds very nice. I think I might just want to upgrade now. My 1st article was published in EzineArticles.com on 28 December 2012. There’s 7 more articles in queue. This offer of Premium Membership is new to me as I knew about it via email from EzineArticles. I may have to read thoroughly first. Thanks anyway. This is cool. Only joined few days ago and getting discount. Looking to upgrade now. Well, this slashed price is pretty awesome. I’m feeling happy for all premium members.